Do you ever wonder why certain ingredients are regularly called for in marinades? Or are you forever on the hunt for a clever way to improve the texture of that cheap cut of meat? Here are several different ingredients to try (some may surprise you) along with a few tips. Salt: We’ve often been warned not to season with salt before cooking or the result will be a tough and dry result…but Steamy Kitchen says that’s just not so! 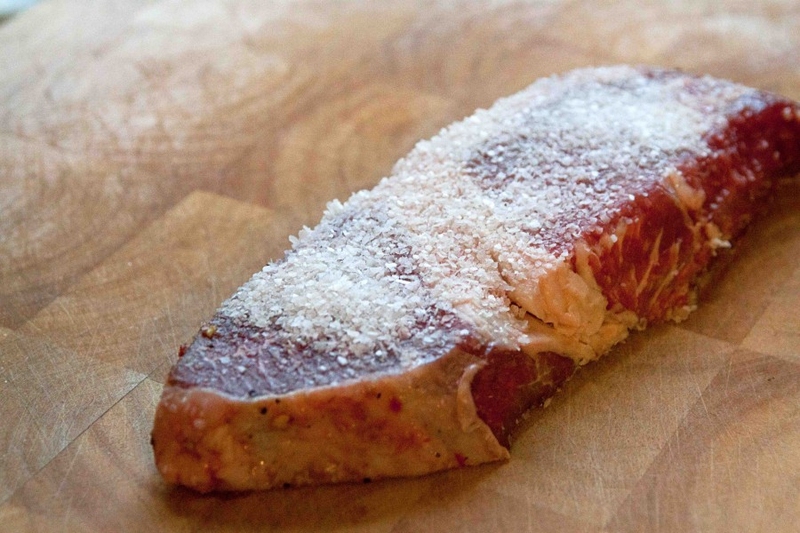 “The Steak Secret: massively salt your steaks 1 hour before cooking for every inch of thickness”. Tea: Contains tannins which are a natural tenderizer. Make a cup or two of strong black tea, allow it to cool and then use to marinate. Wine, Citrus Juices, Vinegar: These are acidic liquids that soften muscle fibers (and add flavor too). For citrus juice, try lemon, lime or pineapple. Vinegar can be apple cider, balsamic or regular household vinegar. Red wine is a good choice since it also contains tannins. Tomato Based Sauces: Tomatoes are acidic which is why you’ll find many barbecue sauces made from them (it’s not just for their great flavor and tantalizing color). They also typically include vinegar which helps increase the acidity level. Beer: Great for adding flavor but beer also contains alpha acids and tannins so it’s a workhorse when it comes to tenderizing meats. Marinate for at least an hour before grilling. Cola: Marinate steak in Coke (not diet) for a minimum of 30 minutes and up to 24 hours. Why does it work? The acid content. Ginger: You’ll often find ginger listed as an ingredient in marinades, did you know it’s not just for its flavor? Ginger contains a proteolytic enzyme that naturally breaks down protein. Coffee: A natural tenderizer that also adds flavor. To use, brew a strong pot of coffee, chill and then marinate meat for up to 24 hours before grilling. Buttermilk & Yogurt: These contain some acidity but they are also dairy items with calcium content, this activates enzymes within the meat that also that helps break down protein. Figs, Pineapple, Kiwis, Papaya: These contain vegetable enzymes that dissolve protein and connective tissues. Apply a fruit mash or slices over the meat and leave for a few hours. These work best on thin cuts. Baking Soda: Just like salt, baking soda will break down proteins as the meat draws it in. Two different ways to do this: Sprinkle baking soda all over, rub it in a bit and then let sit (refrigerated) for several hours. You could also make a baking soda/water paste and slather it over the meat. Let it marinate for several hours. Rinse well before cooking to remove all the baking soda. Server responsed at: 04/23/2019 6:29 a.m.